The Muirhead family are in their fourth generation and third Century of producing and selling grass seed. Please see our series of 3 videos featuring a testimonial from a local buyer, and meet Alison Muirhead, 4th generation seedsman. We have a wealth of experience and the knowledge to answer any questions you may have. 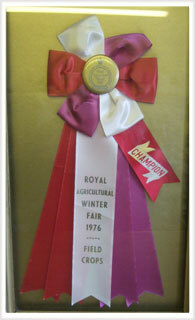 We are the only merchant in United Kingdom to have shown and won the World Champion Medal in the Small Seeds section of the Toronto Winter Fair in Canada. Allowing us the skill to acquire and select the best available grasses and blend them on our premises to your requirements. As we are Independent Seedsmen, we are able to source all available UK Grass Seed varieties from the Seed Houses of Europe. Only Seedsmen are able to produce top quality grass seeds mixtures; unlike merchants that can only sell what they are given from one Seed House, they have no knowledge of what is in the bag. As we are Independent Seedsmen, we are able to source all the best varieties from the various Seed Houses, leaving the poorer varieties for the Merchant mixes. Our website has been split into three sections; Amentity, Agriculture and Equine. The Amenity section has been designed for Professionals and Gardeners, allowing everyone looking for a great finish to have it. A lawn is for life buy the best quality. Only Seedsmen are able to offer gardeners professional quality lawn seed, our mixtures are not available in Garden Centres. No one ever regretted buying quality. The Agricultural section shows you a selection of our best selling mixtures, but as farmers ourselves we understand that you know your land better than anyone, we will mix to your requirements. And our Equine section is for those people with an interest in horses and ponies. Having always had horses we have an expertise in grazing horses, and the knowledge to repair the damage they can do to your grassland. As well as the seed mixtures available on the website we are also able to supply bespoke mixtures tailored to meet any specifications that you may require. We can, if necessary and providing your order comes to us by mid-day, despatch your order 24 hours anywhere in the country. Copyright © 2009 Ross Muirhead and Co.All rights reserved.